Woodstock Flea Market in Honor of Joe Cocker! As I was writing this entry it just seemed so fitting to post it today! Joe Cocker was an icon of the 60's and so was Woodstock! He had been in the music business for many years but Woodstock made him famous everywhere. His cover of the Beatles "With a Little Help From My Friends." even became the theme song for the sitcom "The Wonder Years" another favorite of mine. RIP Joe Cocker, we will miss you. Woodstock seems to have retained their earthy roots! Mower's Flea Market is an amazing collection of clothing, jewelry, art and more held every weekend (except in winter) in a beautiful bucolic meadow. A favorite market of mine, I go whenever I am back in New York. It is closed for winter but will open again with the flowers and spring. The majority of merchants sell second hand and antiques. Really amazing items. 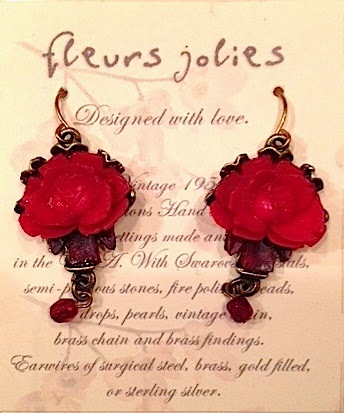 I have purchased so many things here but my favorite has to be the jewelry line Fleurs Jolies! The owner/designer has been purchasing vintage buttons from the same warehouse for thirty years. Her designs while maybe not a cheap fashion fix, are so beautiful and special, a true vintage recreation! Frock You Vintage Clothing and Their Huge Frocking Sales! If you love vintage clothing like I do and you live in the San Diego area you will be excited to know that Frock You is having one of their Huge Frocking sales this weekend and 'tis the season so they are calling it: Frock The Halls! Huge Frocking Sale December 12,13,14 from 11-6pm ! 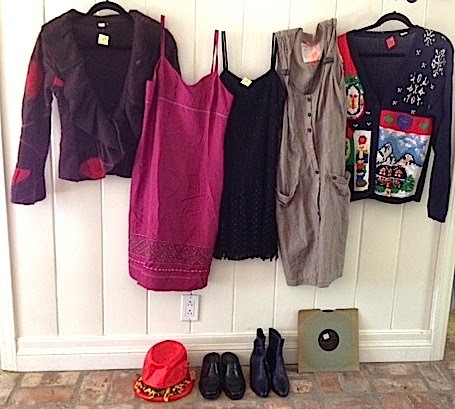 Good vintage clothing is usually a little more than I want to pay so I always look forward to this sale. 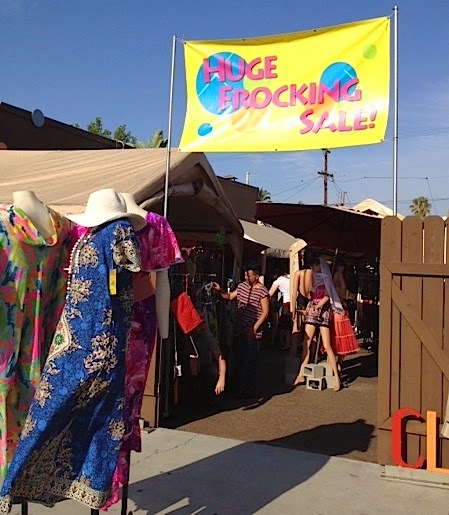 They invite guest vendors to display their clothing in a vintage swap meet. There are always great deals to be found. 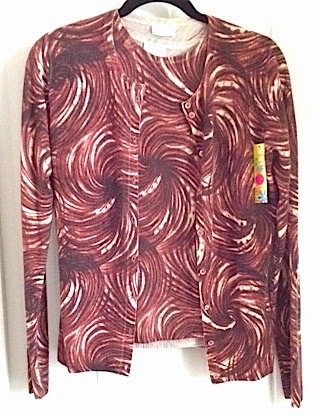 At one of their last sales I purchased this TSE cashmere sweater set for $8.00. Well I didn't purchase them together as I am not really into sweater sets so I purchased the cardigan for $5.00 (both pieces were $5.00 each) and at the next Huge Frocking Sale there was the sad lonely shell for $3,00, so I bought it I guess they were meant to be together! The British Fashion Awards were held Yesterday at the London Coliseum. I wish I could have been there! Growing up my only dream was to travel to London and go to Carnaby Street. It just seemed to like the greatest fashion place on earth. I just looked it up on the internet and it remains a very cool place to shop! The Brand award went to Victoria Beckham for her global impact. Again really expensive but I do like the clean concept of her designs. Preen won the Establishment Designer award for their global retail presence and strong example of British fashion. The Emerging Womenswear Designer award winner: Marques'Almeida. This dynamic duo designed a collection for Topshop that hit the stores in October. So it is nice to have a winner that is also affordable, examples are below. Their line is also on the Opening Ceremony site. Lots of denim! The Alexander McQueen line took the Red Carpet Designer Award, one of my favorites and always have really amazing looks! Of course Anna Wintour received the Outstanding Achievement Award and I must say the print on her dress is reminiscent of the long Altuzarra for Target dress with the orchid print, Target rocks! The global fashion awards are also being held in London next year, I guess they really are still the leaders in the fashion world. Another Great Sale Tracking Site! Another great easy site to use is Shoptagr. With Shoptagr download their button onto your bookmark bar, then search online for your favorite items and click on the button. The site will then track your item and inform you when it’s available in your size and color. They will send an email telling you when it goes on sale. Choose from over 300 stores and online retailers from Barneys to Target! and Ebay too! Another Great Online Shopping Site! Shop It To Me is like having a personal shopper. Choose from at least 900 top brands. Fill out information on your size and select designers and brands you love. You decide how often you want to receive custom-tailored sale information directly to your email inbox. They do limit their list to top-quality retailers. I requested daily emails and I am really happy with the information they have sent me, (I should be, it is what I asked for), great deals that I didn't have to search the internet for. I guess the only downside could be that you may have to act quickly as I am sure they must have a large customer base due to being named one of the "Best 50 Websites 2012". IPhone users will be happy to know that there is an app! I am not a big fan of online shopping. I don't have the patience to sit and search for fashion online. I would much rather see and feel the items I am looking at. Another reason is probably due to the fact that I dislike shopping with an exact item in mind. I enjoy shopping with the freedom to come across something I may want to add to my wardrobe. The option I like best about this site is you can download their button to your bookmark bar on your computer and when you see an item you like online you press their button, it pops up a window that asks you the color, size and the sale price you want to be notified for, like magic! On the Rack It Up site you can also choose women, men, kids or home categories from 103 stores. You actually pick the items you want the sale alert for, the percent or price you are looking for on sale and to put in your "closet". When the items in your closet go on sale you receive an email alert. Seems pretty easy! Maybe I'll start liking online shopping! Now For A Fashion Site with Sales and More! A great site that I really like is Racked. It doesn't just alert you to sales as the other sites I have blogged about but it is much more. Racked reviews all kinds of stores and covers current fashion stories as well. They have a section called "Where to Shop" that lists what they describe as their Essential Stores, which include lists of must go to beauty, vintage, indie and home stores. They also offer news by neighborhood for the following cities: Los Angeles, San Francisco, New York, Miami. I really like their list of vintage stores in the LA area as I frequently shop at many of the stores listed. A warning here, some of the vintage stores are quite pricey but are amazing to visit anyway as the collections and quality are fabulous! Great Bargain Hunting Websites, Day Three! Another good Wareshouse sale website is WHSale. It is also by state and again you can sign up for email alerts so you never miss out on a sample or warehouse sale again. Here is a link to the site and enjoy black Friday savings without going to a mall! Great Bargain Hunting Websites, Continued! It covers all states and you can sign up for email alerts so you will never miss out on a great sale again. Not just for clothing either, toys, accessories, skincare and more! Most of the sales offer huge discounts. One of my favorite examples was an Obey warehouse sale (if you have kids you know the brand well) and everything was $10.00! We got six shirts for the price that one shirt regularly sales for! Last week in my area Toms had a warehouse sale, huge discounts and their one-for-one policy was in effect. For every item that was purchased, one item was donated to a person in need. 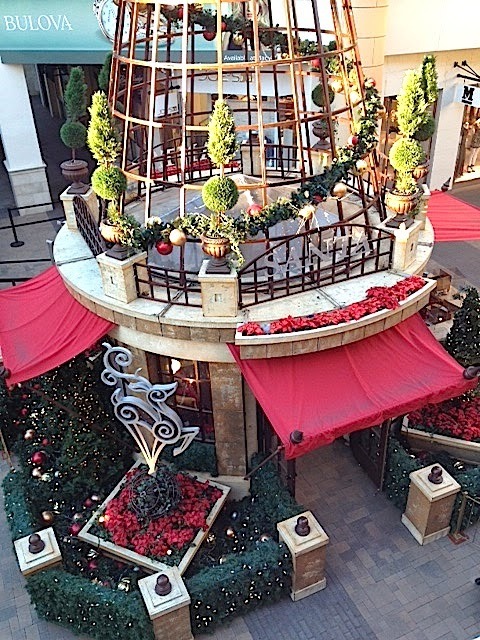 What a great way to start your holiday shopping! A side note: Toms is now at Target and blowing out of the stores. They have the shoes we all know and love and they have a line of tops and accessories, mugs and picture frames too! For the clothing and accessories; for every piece sold someone in need will receive a week of meals! Shop and feel good about it. Joy to the world indeed! Great Bargain Hunting Websites, Part 1. In time for holiday shopping, my gift to everyone: sharing great bargain websites. Years ago when my son was acting, he and a cute girl were cast is a film. Her mother was a lively, beautiful redhead. It turns out she had a website for bargain shopping, how awesome is that? She travels all over the Los Angeles area getting the lowdown on sample, store and warehouse sales. I even heard her on the radio giving out bargain advice, so cool to hear her voice again! That was years ago before I started blogging and here I am able to share her information. It's funny how our lives are connected, and we meet people that later become important in some way. She has information on deals for everything from services to groceries and furniture. Today on a LA news radio channel, I heard a most disturbing statistic. The average US citizen throws out 70 pounds of clothing per year, that is horrible news. What is one person's trash is another one's treasure (at least to me)! So to celebrate I went shopping at a DAV (Disable American Veterans) store, after all this week we did celebrate Veteran's Day. (DAV is a great place to donate EVERYTHING, even buttons!) For $37.10 I got all of this! Every piece piece is in perfect condition (well, except maybe the record but it is really old). Jacket is 100% hand felted wool, made in Nepal. It looks like a piece of art, I love it and will probably never get to Nepal-$3.95. Fuchsia slip dress (one of my favorite styles) 100% silk by Ann Taylor-$3.95. Black rayon lace slip dress (told you) by Nicole Miller New York City-$2.95. Grey striped dress with real leather straps by a Dutch clothing company called Not The Same (average price for dresses $125.00)-$3.95. Have to have an ugly Christmas sweater for holiday parties. This one is beautiful-$3.95. Had to get the vintage hat, when you find them in perfect condition why not?-$2.65. topstitching, they will look great with jeans and the booties are dark blue leather made in Brazil. The 78rpm is Romeo Nelson's "Head Rag Hop" from 1929-$0.95. It does't look very scratched and it may actually play, but the history just makes it so cool! So this was my haul, such a great shopping day! If you are tired of your clothing have a trading party with your friends. You can donate, and most places pick up. So please repurpose, recycle and reuse! Mercedes-Benz Fashion Week Zurich Ends Tomorrow! Well, I have been searching to find photos for Zurich Fashion Week. So far I have not been able to find any magazine coverage for photos then I magically figured out the Fashion Week website. Their fashion week actually started with Italian designers, the first to show was Max Mara, but sadly no photos were available. It would be nice to see if they have the exact same pieces for a different show, or if they mix it up a little. There are no photos for all of the lines, but these two were my favorites. The first: Di Liborio is on-trend with the 70's vibe. Silky, flowing with lots of fringe and some rocker looks too. The lower photo is a line called Vivetta. It is bright, and alive with a sense of humor. 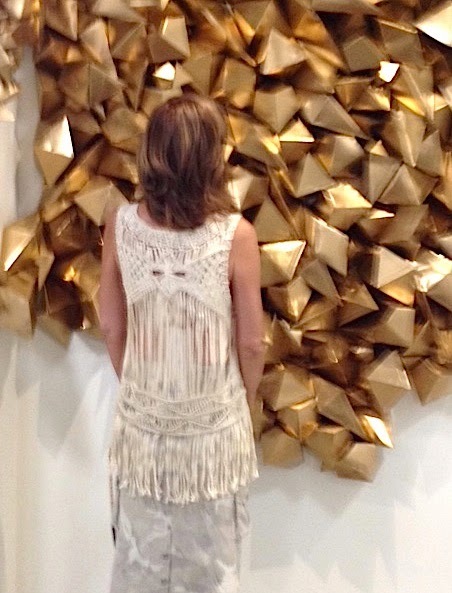 Some of the pieces are on the border of wearable art as if you look closely you will see hands and faces. Fashion Week: Street Fashion Around The World! On the runway fashion is shown almost as if in a dream. Tall unsmiling perfect models appear out of nowhere, gliding past the crowd on an empty "street" wearing perfect pristine outfits, never acknowledging the humans that have gathered to watch. Life is not perfect. Fashion shouldn't be either! That's why there are always magazine and web columns of "who wore it best" or lately comparing Taylor Swift to Amal Alamuddin because they have been photographed wearing the same outfits (yes, more than once). Fashion seems easy if you have the money to buy a complete designer outfit but I believe fashion should be a more personal, interactive experience. I am hoping to add more street styles to my blog. The real people on the streets that have a personal style of their own. Someone who is able to take a designer outfit if they have the money to buy it and make it their own, or like most of us without that money to dress like ourselves and be happy in our own "skin." I picked the most interesting fashions but believe me there were plenty of jeans and t's worn even to Fashion Week, showing that not everyone bows down before the fashion gods. I wanted to show street fashion from the LA shows but I am really sad to say that there were only one or two people that wore interesting outfits. The one below is mine, a macrame back top worn with a vintage Da Nang camouflage silk skirt, which I purchased at a DAV store for $4.95! How Could I Have Missed Shanghai Fashion Week? 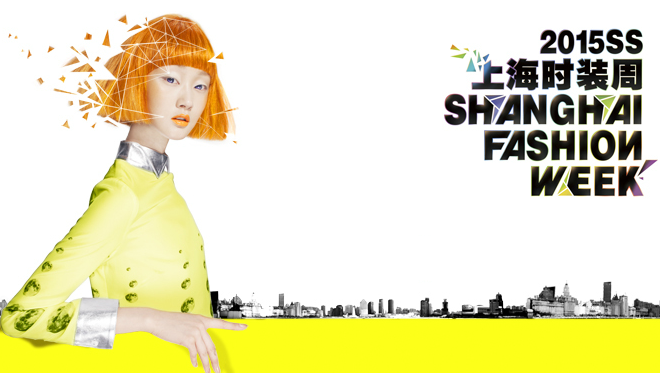 Shanghai Fashion Week is actually 10 days of fashion and is another fashion week not sponsored by Mercedes-Benz. Yay, LA has good company. I found a lot of the designers to have very independent modern designs. (except for the Disney Princess line but that's another post) My favorite line is called Moodbox. It is a line designed by Niki-Qin xu a Shanghai local. After I read about her design aesthetic I loved the line even more. It has to do with her attitude toward life, respect for nature and the freedom of female designers. 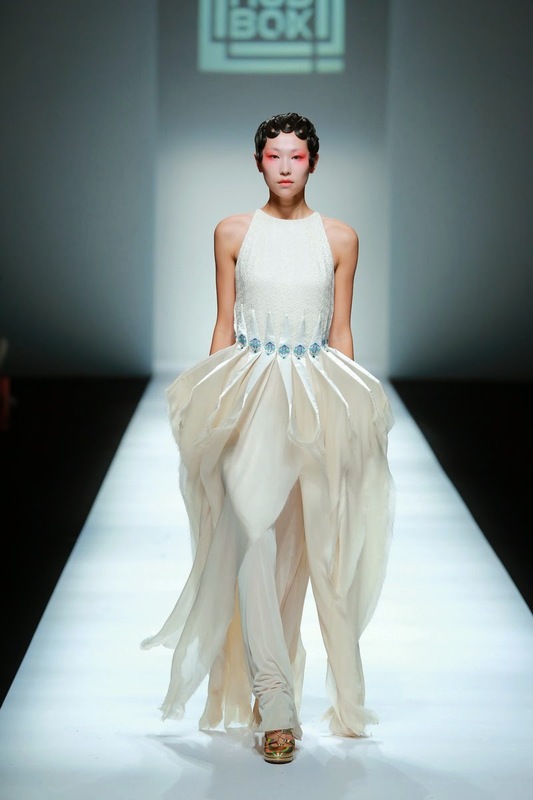 Here is one of her incredible dresses courtesy Shanghai Fashion Week website and Moodbox. Now I wish I could shop in Shanghai! Honolulu Fashion Week and Project Runway! The hit of Honolulu's Fashion Week was the contestant from the last season's Project Runway, Hawaii’s Kini Zamora and his partner Dean “Dinko” Satta. I loved Kini's designs on Project Runway and he was able to produce well made, well designed pieces very quickly. At most challenges he was already finished while the other designers were scrambling to get their pieces finished. Their Kini and Dinko collection is entirely black and white (my favorite clothing colors). Clean modern shapes that look much more New York than Hawaii. The next Mercedes-Benz fashion week coming up is Zurich November 12-15. Max Mara is the headlining designer and this is the first time the luxury-brand is showing at the five year old Zurich event. Here is the link to the Facebook page which is updated daily. I know the Swiss have always been famous for their watches, I can't wait to see their designers! My Dress Find In Honor Of Honolulu Fashion Week! Honolulu is holding it's first fashion week and I can't find any photos! I've been able to find great photos of all other events but I give up. Here is the link to a magazine which will hopefully post something. In honor of their first fashion week I found a gorgeous silk dress. I found this at Burlington Coat Factory, a store I have never looked at before. If you can beyond the mess, they do have some great lines and great prices. I found a group of Alice and Olivia clothing that was beautiful. You just need time to wander as the stores are overwhelming large. It will look great dressed up or down with the addition of a jean jacket! I must say I am a little jealous, Brazil has two world famous designers: Stella McCartney and Versace launching affordable apparel collections for two of their biggest department stores C&A and Riachuelo. The collections are affordable; McCartney's price range is $35 to $150, while the Versace line (based on best-sellers and prints of the era of Gianni Versace) is a little more with everything retailing at under $400. The Internet has made the world a smaller place and through the magic of Google translate I am able to "read" all languages! 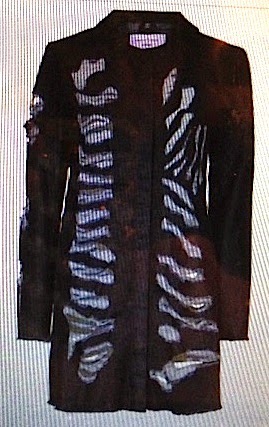 I couldn't find the McCartney collection but for you fashionistas out there here is the link for the Versace line. Of course even though I can read all languages you never know how a designer's sizes fit until you have tried them on, ah the dilemma of online shopping! A link to my Pinterest for anyone not wishing to search for SPFW photos! Even though today is officially the last day, the high point was the Versace show last night. The audience was treated to a carnival complete with bumper cars, carnival games and shirtless sailors! Wow, Tim Burton was so prophetic, our holidays are actually colliding. 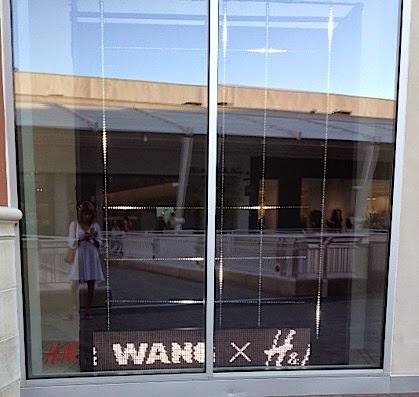 I went to the mall today to check out what was left of the long awaited Alexander Wang collection at H & M and Santa was already on duty. When did we start celebrating Christmas after Halloween? What happened to Thanksgiving? Now I am feeling so far behind. So back to the Alexander Wang collection. Last year I was so excited when I heard about his collection for H & M. I love his clean modern lines and design aesthetic. People here started to line up at 8:00 P.M. last night, I don’t love any designer that much but I am amazed at the people that will wait so patiently. Last year the Isabel Marant collection didn’t sell out and was still available online, so I was a little surprised to find almost everything gone and sold out on line. I guess the preview really worked to get people excited. I can’t wait to find a piece in a thrift store!